Hermann Göring, a pilot of the First World War, spent the 1920s in Sweden. There he married Karin Kantzow, whose sister was married to Count Eric von Rosen, the person who had donated the first aeroplane to the Finnish air force. Göring adored his wife and had a hunting palace built for her, which he named Karinhall. Mannerheim visited the palace on his hunting expeditions. During Hitlers reign, Göring held different posts, he was, e.g., Prime Minister of Prussia, Commander of the Air Force and the leader of the Four-year Plan. 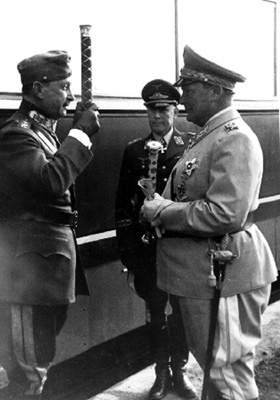 While chairman of the Defence Council, Mannerheim was invited by Göring to familiarize himself with German aircraft industry in September 1935. Later on this acquaintance proved useful. Through Eric von Rosens mediation Mannerheim was made aware of Görings impressions of the development of world politics from the German point of view. In the course of the Second World War, Görings personal influence in Germany diminished.